Here is my curated collection of learning resources to explore computational thinking with students. Having a good balance of activities, resources, approaches and pedagogies (even platforms!) would seem to give students the richest learning experience. Critically, encouraging them to become self-directed learners provides opportunity for each individual. The code.org courses are an excellent foundation that provide an excellent combination of individualized progress, collaborative work, demonstrations and videos as well as a balance of online and offline activities. This post attempts to add to their list with software, externals and even a board game! Here is my list of useful resources by age, reasoning, platform, type as well as a link to a review on Graphite if available. Surprise, surprise that Scratch features prominently in my list as it is rich in learning opportunities and has a well established foundation of academic research and expertise from Seymour Papert’s Logo to Michael Resnick and his team’s current iteration of Scratch. Also links nicely with externals like Lego We-Do and Makey-Makey helps too! Please feel free to explore my Scratch page for my detail analysis and resources. The code.org site does an amazing job at creating a list of curriculum resources (including videos, quizzes and activities) in many distinct courses. I really liked the fact that students had choice based on interest, readiness and time. A self-paced course for teacher interested in exploring the page with students. 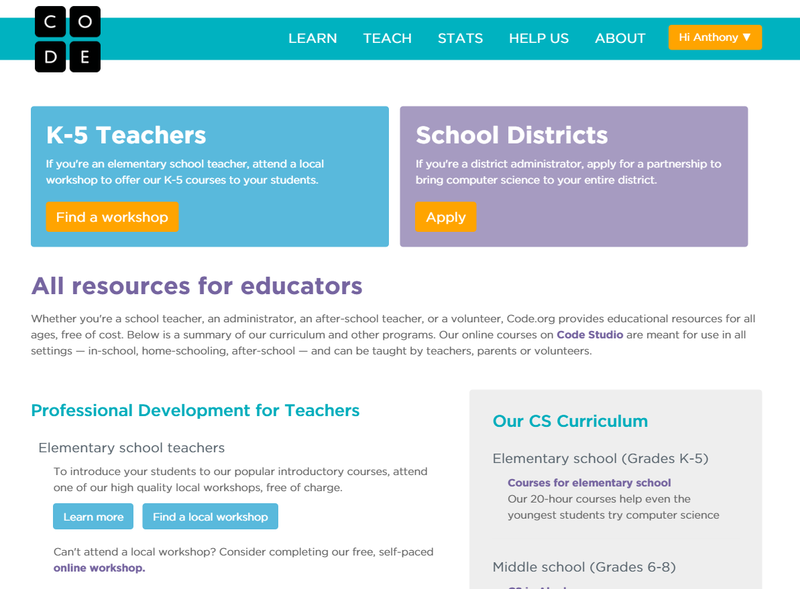 Here is a screenshot of the Education page. We had so much fun exploring this site and by the end of the year students were self-directed, collaborative when necessary and wrote collaboratively over 10,000 lines of code. Here is my very rough draft of resources and tools for developing computational thinking in the K-12 environments. As with exercising any particular way of thinking, keep in mind that they may progress at a rate determined by their interest, experience and opportunity. Overall, I believe all students should have an opportunity to learning this type of thinking and it should also be used integrated tool for students. 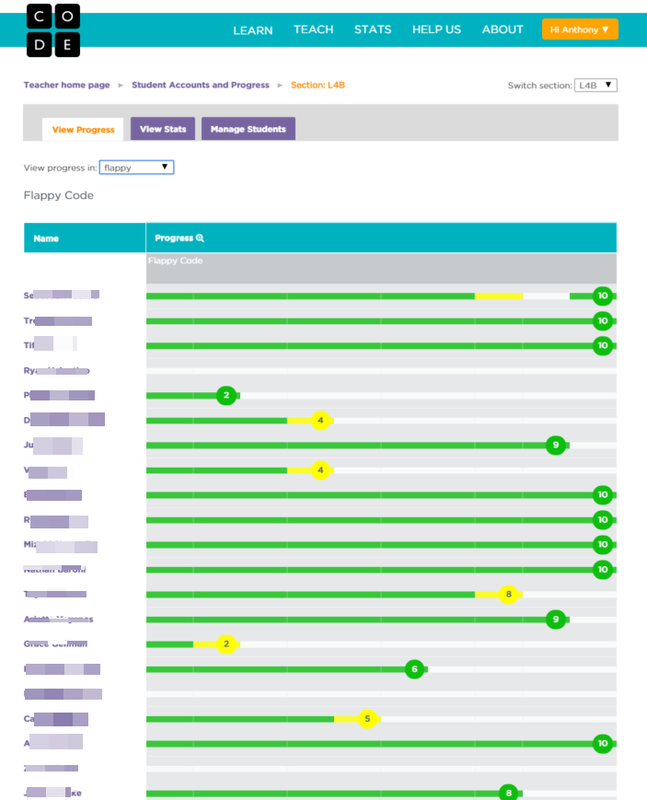 When researching a topic, students may demonstrate the learning goals and tackle essential questions through the creation of a computer program. This could be one of many tools (i.e. essay, slideshow, script, animation, presentation) as a platform for their learning. Perhaps educators provide the map and students provide the app. This collection below is sample list but please visit Graphite for a comprehensive reviews on computational thinking and educational technology apps from a variety of a educators from around the world.